Had this recipe for sometime from a foreign newspaper cut out. Thought I give it a try with my own tiny adjustments. I don’t normally use pork for curry due to being brought up in a muslim country pork just doesn't associate with curries in my brain (think I am still brain washed :)). As you can see from this picture below, this pork curry is quite dry and rich, the texture is similar to Malaysian Rendang without the rich coconut milk. It was very tasty indeed. I will definitely make it again. 1 chunk of wet (semi dried) tamarind pulp with seeds (about golf ball size), if using seedless use less, if using ready to use concentrate use about 3 – 4 tbsps unless it is a very thick paste then use about 2 tbsp. Prepare the spice paste. Peel the onion/shallots, garlic and ginger. De-seed the fresh and dried chillies. Soak the dried chillies in warm water till softened. 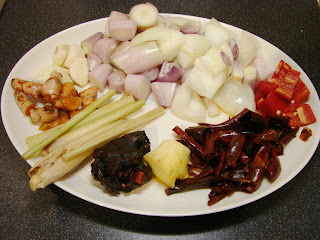 Then cut the spices into small chunks then put all (incl. 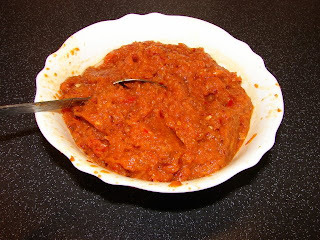 ground turmeric/ tomato paste if that's what you are using) in a mini blender, liquidiser or food processor and blitz till smooth, if the blender is a bit struggling add some water and blitz again till you get a smooth paste like this. Cut the pork into 1 inch (2.5 cm) cubes. Soak the wet tamarind with about half cup of boiling water, wait till it has cooled down then squeeze with your fingers and press the pulp with a large spoon through a sieve. Discard the seeds. If you use ready to use concentrate, ignore this stage. Peel and remove the first woody layer of the lemon grass. Top and tail. Cut into half then bash or bruise the pieces with something heavy or a clever. Heat the wok or a large pan with the oil till hot, add in the spice paste and stir continuously for a minute or two on medium heat, then turn the heat right low and stir every now and again for about 15 minute (with the lid on ajar when you are not stirring because the paste may spit everywhere and you will get a very dirty hob), till the oil has beginning to split from the paste. Add in the pork and lemongrass, stir for a while then lid on and let it simmer gently for about 20 minutes with occasional stirring to prevent the bottom sticking. Then pour in the tamarind juice, stir and lid back on again. Continue stirring now and again (with lid on when not stirring) till the pork is tender and sauce has dried. Cooking time is around 1 hour. The sauce should be quite thick and the oil splitting from the paste. Add enough fish sauce and sugar to taste and stir in coriander. 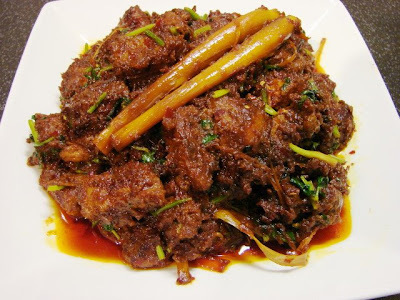 I'm really beginning to get into my dry curries, I must give the rendang a go. This looks delicious. I was making this last night and went outside to fix my bike, stayed to long and when I came back i'd totally incinerated the spice paste! Gutted. I rescued the top half and bodged it with some creamed coconut, it was quite nice in the end but not the proper deal, I need to make asap. Oh dear! Try again. I like this recipe. You have reminded me to make some again.